The MP4-12C GT3 features a unique engine calibration, bespoke racing transmission developed in partnership with Ricardo, who also developed the engine with McLaren, and a suspension arrangement tuned specifically for racing. WOKING, England -- McLaren Group unveiled a 310,000-pound ($500,000) track version of the MP4-12C supercar in an bid to establish race credentials for its rival to the Ferrari 458 and Lamborghini Gallardo. The GT3 racer is priced at double the cost of the road car and will make its competitive debut in an endurance event at the Navarra circuit near Pamplona, Spain, on May 22, McLaren said after presenting the model at its base in Woking, near London. 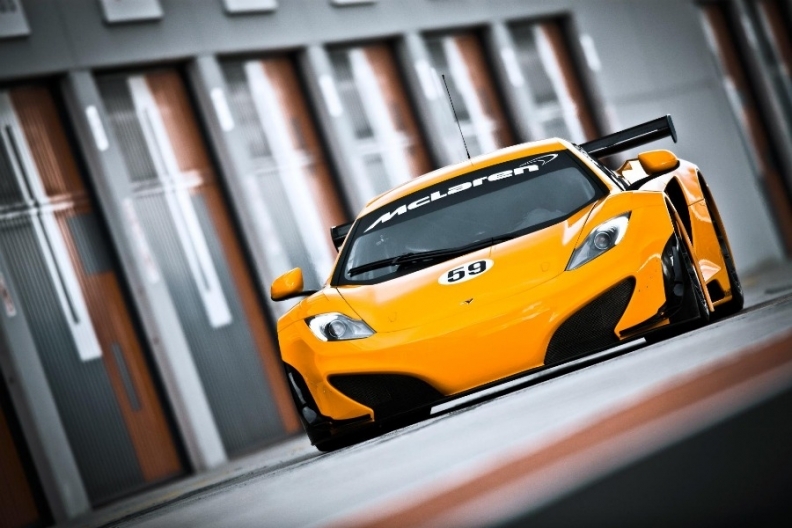 "We want to do things properly so that McLaren will be seen as the gold standard in super sports cars," Antony Sheriff, managing director of McLaren Automotive, said on Wednesday in an interview. "We're not trying to sell a few cars over a short period; we're building a brand and we're here long term." McLaren, best-known as the most successful Formula One team after Ferrari, said the new model will do most of its racing in Europe's FIA GT3 competition. The series currently features cars from Aston Martin, Audi, BMW, Ferrari, Ford, Lamborghini and Porsche, as well as the $500,000 gull-wing SLS supercar from Daimler AG's Mercedes-Benz, new to the circuit this year. About 20 McLaren GT3 variants will be delivered to customer teams in Europe in 2012, and the car may also be entered in the 24 Hours of Spa endurance race and other events worldwide. The MP4-12C road car, successor to the McLaren F1, the world's costliest auto in the 1990s and the fastest at 240 mph, has racked up 1,700 orders even before being displayed at 35 global dealerships due to open this year, Sheriff said. "It's rising on a daily basis," he said. "We have seen a fairly linear increase since we opened for orders last summer." Concern that the car might struggle to win buyers in North America, where Formula One has a lower profile than elsewhere in the world, was misplaced, Sheriff said, adding that, "if anything, demand in the U.S. has been even higher." The model will be available for viewing at McLaren's showroom in Hyde Park, London, next month. In the U.S., the No. 1 supercar market, it will go on show in August in Greenwich, Connecticut, a town known for its concentration of hedge funds. McLaren will initially have nine U.S. dealers in cities including Beverly Hills, Chicago, Dallas, Miami and New York. The MP4-12C takes its name from the MP4 designation given to all of McLaren's race cars since 1981, the latest being the MP4-26 driven by Jenson Button and Lewis Hamilton. The "C" indicates the road car's carbon construction and the "12" is a reflection of "internal performance criteria" including weight, aerodynamics, power and down force, Sheriff said.